We are pleased to announce that on the evening of Wednesday, June 13 we will host a special Philanthropy Dialogue, “Giving Until It Feels Good”: Bill Cummings Shares His Model of Entrepreneurial Philanthropy. Bill Cummings of Cummings Properties has become known as a leading philanthropist as much as a Boston-area commercial real estate magnate, and the two are not mutually exclusive, as Bill shares in his memoir, “Starting Small and Making It Big: An Entrepreneur’s Journey to Billion-Dollar Philanthropist.” In discussing the book with TPC members, our guests, and our grantees, Bill will describe how his business philosophy has ultimately governed his giving practices and the establishment of Cummings Foundation, which has awarded more than $200 million in grant funding to non-profits in Greater Boston, as well as internationally. We are delighted to note that Cummings Foundation and TPC share similar missions, evidenced by the 15 overlapping non-profits we have supported over the last few years. 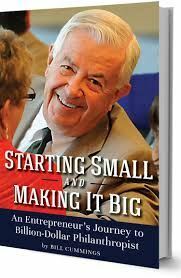 To maximize learning and engagement, please consider purchasing and reading in advance “Starting Small,” which is available for purchase at your local bookstore or online. Additionally, copies of the book will be available at the event for both purchase and signing. All proceeds from book purchases at the event will be graciously donated to TPC by Cummings Foundation. We hope you are able to be part of this community of giving for what promises to be an enlightening and educational evening with Bill and his wife Joyce. The Philanthropy Connection thanks the Center for Women and Wealth at Brown Brothers Harriman for underwriting these important educational events for our members.